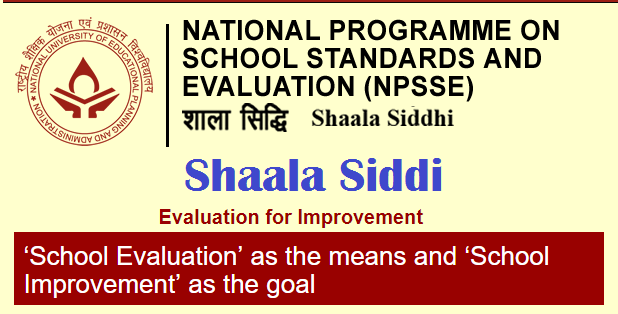 NPSSE Natiojnal Programme on School Standards and Evaluation by NUEPA National University for Education Planning and Administration all over the India Ministry of Human Resource and Development, Govt of India Developing a flat form for Self Evaluation of Schools The National Programme on School Standards and Evaluation (NPSSE), known as Shaala Sidhdhi is a comprehensive instrument for school evaluation leading to school improvement. Developed by the National University of Educational Planning and Administration (NUEPA), it aims to enable schools to evaluate their performance in a more focused and strategic manner and facilitate them to make professional judgments for improvement. The programme’s objective is to establish and refer to an agreed set of standards and to provide clear pathways for each school for self evaluation, by focussing on key performance domains and their core standards for school evaluation. The structure of the Framework is simple yet flexible and lends itself to both self and external evaluation. The need for effective schools and improving school performance is increasingly felt in the Indian education system to provide quality education for all children. The quality initiatives in school education sector, thus, necessitate focusing on school, its performance and improvement. In a major step towards comprehensive school evaluation as central to improving quality of school education in India, National Programme on School Standards and Evaluation has been initiated by National University of Educational Planning and Administration (NUEPA), under the aegis of Union Ministry of Human Resource Development. NPSSE visualizes ‘School Evaluation’ as the means and ‘School Improvement’ as the goal. It refers to evaluating the individual school and its performance in a holistic and continuous manner leading to school improvement in an incremental manner. The major objectives of NPSSE are to develop a technically sound conceptual framework, methodology, instrument, and process of school evaluation to suit the diversity of Indian schools; to develop a critical mass of human resource for adaptation and contextualization of the school evaluation framework and practices across states. The programme envisions reaching 1,6 million schools in the country through a compressive system of school evaluation. As part of this endeavour , the School Standards and Evaluation Framework(SSEF) has been developed as an instrument for evaluating school performance. This will enable the school to evaluate its performance against the well-defined criteria in a focused and strategic manner. The SSE framework comprises seven ‘Key Domains’ as the significant criteria for evaluating performance of schools. The Framework has been developed through a participatory and mutual consensus approach on 'How to evaluate diversified Indian schools for Incremental Improvement ’.The SSEF has the flexibility that makes it eminently suitable for adaptation, contextualization and translation in state- specific languages. It has been designed as a strategic instrument for both self and external evaluation. Both the evaluation processes are complementary to each other and ensure that the two approaches work in synergy for the improvement of the school as a whole. As part of the SSEF, a ‘School Evaluation Dashboard-e Samiksha’ has been developed to facilitate each school to provide consolidated evaluation report, including areas prioritized for improvement. The School Evaluation Dashboard is developed both in print and digitized format. The School Evaluation Dashboard, obtained from each school, will be consolidated at cluster, block, district, state and national -level for identifying school- specific needs and common areas of intervention to improve school performance. A web-portal and Mobile App on School Standards and Evaluation are in the process of development. In order to translate the objectives of NPSSE to institutionalize ‘School Evaluation for Improvement’, a strong operational plan has been formulated to extend support to each state. .A dedicated Unit at NUEPA is leading this programme under the guidance of National Technical Group (NTG) and in strong collaboration with the states. A detailed Action Plan has been developed to institutionalise Shaala Siddhi by the respective States and UTs with the support of MHRD and NUEPA. All States/ UTs in consultation with NUEPA are visiting and accessing online Framework of National programme on School Standards and Evaluation and other documents. Adaptation and translation and capacity building of the stakeholders for the effective implementation of Shaala Siddhi is on trial. Tamil Nadu, Maharashtra and Madhya Pradesh being lead states accomplished state specific adaptation and translation of documents and SSEF in their respective regional languages. A few States consulted NUEPA for professional support and guidance to undertake this task. Maharashtra not only adapted and translated the Shaala Siddhi document in Marathi but also planning to roll out the programme in 70 schools. Andaman & Nicobar, Madhya Pradesh and Puducherry have already organised capacity building programmes and Goa is scheduled to organise the programme shortly. A National Consultative Meet on “Shaala Siddhi” is scheduled to be organised by NUEPA shortly to discuss and deliberate on the effective implementation of the programme. All the States/UTs are being asked to cover all their schools under the programme in 2016-17 and subsequently the said evaluation would be a yearly activity.